We are proud to announce the Winners for the 2019 Edison Awards™. 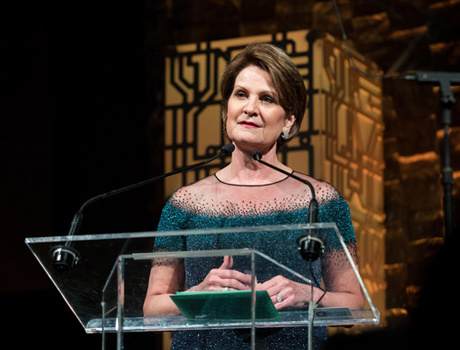 These Gold, Silver and Bronze Winners were chosen as the "best of the best" by the world's top senior business executives, academics, and innovation professionals. 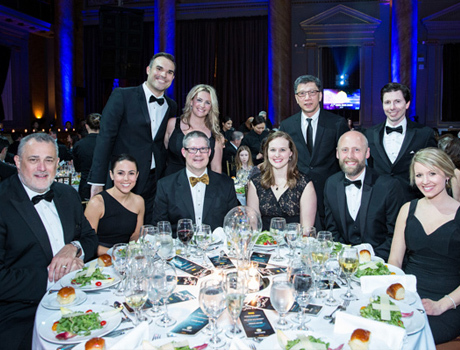 Being recognized with an Edison Award™ is one of the highest accolades a company can receive in the name of innovation and business success. 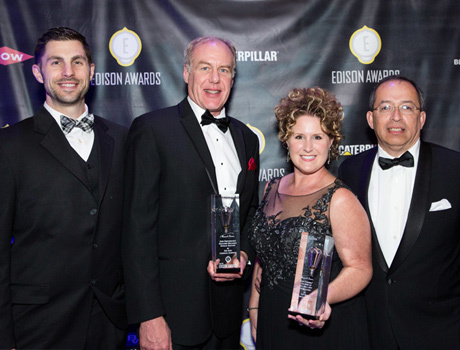 The Edison Awards honor excellence in new product and service development, marketing, human-centered design and innovation. We congratulate all of our winners for their accomplishment! Momentus provides in-space transportation services for satellites between various orbits out to deep space. 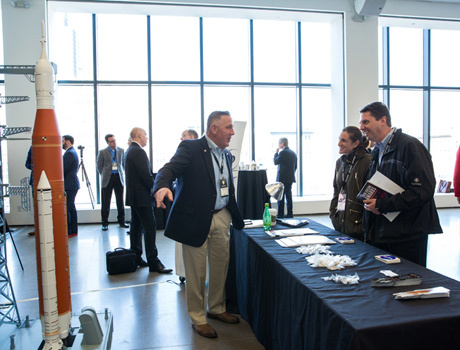 Our water-powered in-space rockets provide last-mile logistics, connecting customers from where their rockets drop them off to their final destination. Our mission is to provide the most efficient in-space transportation powered by deep space resource utilization services. Alice is an all-electric aircraft designed to take 9 passengers up to 650 miles at a cruise speed of 240 knots. It's state-of-the-art technology leverages an IP portfolio that includes thermal management and autonomous landing, as well as distributed electric propulsion, airframe design, industry-leading battery technology, and cutting-edge composite body frames. Maxwell by © Phase Four, Inc.
For the first time, Phase Four’s electric-powered satellite thrusters -- about the size of a smart phone -- replace traditional combustion engines. They enable small satellites to avoid collisions and maneuver precisely once in orbit, and significantly reduce the cost of satellite transportation. Pointillist is the first customer journey analytics platform, designed for CX and marketing teams, that discovers and optimizes customer journeys in minutes rather than weeks—without the help of data scientists. It directly ties customer journeys to hard metrics like revenue and churn and orchestrates personalized engagement. Catalyst by GreyB Services Pte. 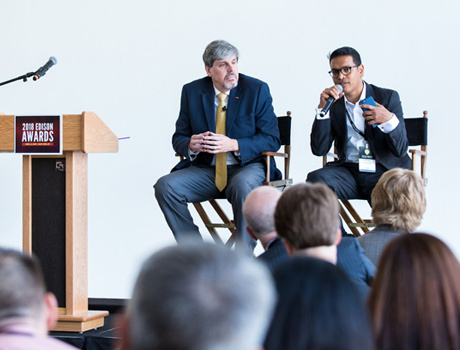 Ltd.
Catalyst enables researchers and inventors to tap into the vast, but underutilized and difficult to comprehend, knowledge existing in patents and gather ideas on how to devise better solutions and products faster. Catalyst obviates the need for researchers to gain legal expertise to search and understand patents written in a convoluted manner. simMachines Cloud by simMachines Inc.
simMachines Cloud is the world’s first Explainable Artificial Intelligence modeling tool, giving users full transparency into Why a model predicts an outcome. Users can better tailor their resulting action, while trusting their model’s reasoning and ensuring it’s free of bias. MELD™ is a technology for metal additive manufacturing (AM) offering superior performance and flexibility to any other process. Unlike competitors, MELD™ is a no-melt process and requires no vacuums or chambers, providing users with unique material choices and the power to take AM to environments previously impossible. ECOFAST Pure breakthrough technology enables unique, brighter colors on cotton while reducing dye, water and energy up to 50%, chemical use up to 90% in the dyeing process. This patented pretreatment advances a more efficient textile industry leaving cleaner water discharge. HYDRO-NDD 2.0 is a water based decoration method which greatly reduces contaminating emissions sent into the environment from traditional printing methods. The new technology delivers the same high quality colour and texture. At Awake our mission is to deliver the secure foundation for the automated and connected workplace. We use artificial intelligence to combine data with deep security expertise. This helps identify the true attack surface, isolates threats that today go undetected and enables rapid response. R9B delivers advanced cyber threat hunting (HUNT) via its proprietary ORION platform, which is built to enable human-led cybersecurity operations. Special capabilities include: agentless deployment, live memory analysis, and multirole task management, along with an API for seamless integration. The YubiKey 5 NFC is a hardware authentication device that provides superior protection for online accounts to keep them safe from hackers. It is the first multi-protocol authentication device on the market to support FIDO2, the new open standard allowing for passwordless logins. When IBM unveiled IBM Q, an industry-first initiative to build quantum computers for business and science, the team ensured the technology would be made available to everyone. Tactical Welder by UltraTech International, Inc. The Tactical Welder is a battery-powered welding system that is entirely portable and produces more power than anything like it on the market. The Welder works off of a single battery pack capable of generating 300 amps. DUO is a portable dual-screen laptop accessory that promises to boost your productivity by up to 50% .Attach DUO to the back of any laptop, and you’re ready to work wherever you are! DUO is plug and play and provides flexible rotation & dual-sided sliding with 270° rotation, and the option for a 180° presentation mode, in 1080p display. DUO is also lightweight (1.5 lbs), energy efficient and incredibly durable! The Hadrian X construction robot is a fully automated 3D robotic bricklaying system capable of building a house in two days. Hadrian X uses FBR's Dynamic Stabilisation Technology, which corrects for environmental factors in real time enabling precision robotics in large scale outdoor applications. The Gecko robotic gripper uses millions of micro-scaled fibrillar stalks that adhere to a surface using powerful van der Waals forces—the same way that geckos climb. The Gecko gripper lets robots pick up flat, smooth objects with significant energy savings over existing grippers. AIRSKIN® is an add-on safety technology for industrial robots and grippers. The pressure sensitive skin detects whenever the robot comes into contact with any object, particularly humans working alongside the robot, and issues a safe stop. AIRSKIN® turns any robot into a safe collaborative robot. Bot Store is the world’s leading online marketplace for off-the-shelf, plug-and-play digital workers and software bots that help accelerate automation for diverse industries and business functions. As a platform that enables bot creators and users to engage and transact, Bot Store is creating a new bot economy to deliver significant productivity and economic value for participants. prooV provides an end-to-end solution for running proof-of-concepts to evaluate innovative vendor technologies. Companies can open PoC opportunities that reflect their innovation needs, configure dedicated testing environments and test multiple solutions at once to measure and compare performance. Adapting Agile methodology and novel partnerships accelerated delivery of a new Atropine Autoinjector to treat troops exposed to nerve agents. Overlapping Iterative and Incremental Development and collaborations enhance readiness for military and first responders against deadly chemical threats. The Leidos Enterprise Application Framework (LEAF) is a development framework that teams use to write code for domain-specific functionality. LEAF comprises a set of reusable software libraries and microservices used to develop or modernize a wide range of applications quickly and efficiently. ALTO AIRGAP by Disk Archive Corporation Ltd.
ALTO AIRGAP provides a physical and real air gap to the actual wires connecting network. It fortifies already extremely secure long-term digital data storage system ALTO. The air gap is created by a specific add-on hardware to ALTO G3. It is remotely and securely controlled by an automated access channel without a human operator. The channel is analog and independent of the data channel to the digital data storage and archive. The PowerDolphin is a beautifully dynamic and innovative streamlined design with a robust body featuring state of the art hardware for scientific research and outdoor fun in any body of water. Meet your new personal trainer. Tonal is a revolutionary and compact digital strength training system that utilizes electromagnetic resistance, something Tonal calls "digital weights" to provide a smooth and precise workout experience. Tonal truly is one a kind with features such as adaptive spotting and on-demand personal training, all wrapped in an elegant design only inches off the wall. Pitch Analyzer and Hit Analyzer are mobile apps that mimic MLB analytic systems. Pitch Analyzer serves as a radar gun and virtual umpire that provides visual feedback on pitch flight paths. Hit Analyzer serves as a launch monitor that provides bat path and ball flight characteristics. Spoke provides a simple, integrated ticketing system and knowledge base. It learns to answer the simple stuff on its own and who to send the more complex issues to. The more you use it, the better it gets. Integrations with chat apps like Slack means Spoke works the way employees already do. Using a ground-breaking technology developed by our team, Sched4u® can automatically schedule 200-2400 employees including constraints in 1-70 seconds. Sched4u is faster than existing products by a factor of about 10,000 even for 50-60 employees. Large organizations worldwide; security forces, hospitals are just a few which can now create schedules using Sched4u quickly and automatically. Unlike traditional, behind-the-ear aids, Eargo Max is a rechargeable hearing aid that fits discreetly inside the ear. Patented Flexi Fibers (soft, medical-grade silicone) suspend in the ear canal for a natural sound experience, and amplify sounds within the line of sight (vs surrounding noises). Phonak Marvel is the world's first truly Bluetooth hearing aid to fully support stereo audio streaming from Android and iOS devices. Finally, hearing aid wearers can stream music, phone, video, and more to both ears from billions of Bluetooth-connected devices. Temi combines smart display abilities and a sound system with autonomous navigation to connect users to their friends, smart devices and video communications, hands-free. Temi sees its surroundings and users to deliver an unparalleled human-robot experience with day-to-day usability. ElliQ is the proactive Artificial Intelligence driven social robot helping older adults overcome the digital divide and maintain an active lifestyle. She personalizes her approach in motivating each specific user through unique ‘personality traits’ and multi-modal robotic expressions. INNER REFLECTION™ is based on unique, innovative, AI-driven software technology that improves and expands the capabilities of a smart speaker/personal assistant, making it more useful to users. Powered by ultrasounic virtual sensors, the product is aimed at device OEMs and enables their devices to detect and react to human presence and respond to gestures. Ovis ™ by FORWARDX ROBOTICS, Inc.
By providing a true hands-free and worry-free travel experience, Ovis by ForwardX Smart Suitcase is tailored for travelers with modern-day conveniences. It integrates advanced computer vision technology developed by ForwardX, so that it can follow the user autonomously. The OceanMedallion is a revolutionary wearable that communicates guests’ digital identities with an intelligent network to provide crew relevant information to enhance service delivery and enable all aspects of a vacation including hassle-free payment; keyless stateroom access; on demand service, onboard wayfinding and more. doubletake by NexOptic Technology Corp.
Doubletake utilizes our patented Blade OpticsTM lens system, which supports doubletake’s powerful long-range focal length ability in a thin, compact device . It uses two 12 MP cameras, one wide-field and one narrow-field, that allows the user to zoom in and out rapidly. At under 2 pounds, less than 3.5 inches thick, and IP67 rated, it’s ideal for long-distance and turbulent journeys. It is the next generation of binoculars. Wunder360 S1: FIRST 3D Scanning & 360 AI Camera by Evomotion Ltd.
Wunder360 S1 AI camera, a dual-lens 360°camera with 3D reconstruction, real-time in-camera stitching, and deep learning AI technology that allows AR/VR developers to easily develop 3D content. Day2 is the world’s first dry wash spray: an air-o-sol which revives clothes instantly, so they look, feel, and smell just-washed - no machine needed. Combining the latest in fabric care technology with a premium hardware solution, each bottle saves a wash-load and eases the burden on the planet. LifeGuard® Spill-proof Backing™ by Shaw Industries Group, Inc.
LifeGuard® Spill-proof Carpet Backing™ lets you live confidently on your flooring. This innovation keeps messes from permeating the carpet pad and subfloor, ensuring they don't linger, causing odor and mold, ultimately ruining the subfloor. Now, you can have the cleanest carpet for healthy living. The ClipDifferent Pro is an automatic fingernail clipper that trims nails safely and effortlessly, regardless of physical ability. With the simple touch of a button, it can restore independence for those with limited vision, motor dexterity, arthritis, and a host of other disabilities. "YouCam Makeup" platform and suite of apps by Perfect Corp.
YouCam Makeup marries the highest level of AR, AI, and machine learning technologies to reinvent the way we shop, discover, and experience beauty. With 650 million downloads and impressively accurate makeup try-ons (including over 200 global brands), YouCam is reshaping the consumer beauty journey. TOTO's Flotation Tub simulates zero gravity by offering bathers a weightless experience that eliminates the mechanical energy/load on their joints. Its unique body posture reduces activity in the part of the brain responsible for language, enabling a deep meditative state. B’ZT® is a smart t-shirt that has a washable chipset pre-embedded in the clothing. When a child wearing one of our shirts wanders off, the B’ZT App issues alarms to prevent any missing child. The Nima Peanut Sensor by Nima Labs, Inc. The Nima Peanut Sensor combines unique mechanical and electrical engineering design and a unique antibody to enable the portable detection of peanut in food. Nima can accurately detect 10 ppm and above of peanut protein in a sample of food allowing those with allergies a portable test. Cota® safely delivers targeted power without wires, charging pads or line of sight, opening new paths to innovation for companies and communities, providing a way to fulfill the promise of the Internet of Things, and eliminating the negative environmental and safety impacts of wires and batteries. Wi-Charge safely delivers meaningful wireless power over long distances using focused, infrared (IR) light. By delivering enough power to charge a phone, power a smart speaker or an IoT sensors, Wi-Charge provides a strategic building block for a new generation of smart devices. Our patent-pending design uses the cool air drawn from the earth to naturally cool and moderate the greenhouse temperature. This can significantly reduce energy consumption and bills by up to 80%. For new greenhouse constructions, this means a vastly reduced carbon footprint for cities. VORARAD™ technology for Resin-Coated Sand prevents contamination of water in oil and gas hydraulic fracturing operations by down hole sequestration of naturally occurring radioactive materials thereby simplifying top-side surface treatment while providing reduced flowback of sand to increase oil and gas productivity. The YORK® YZ Chiller is the world’s most efficient low global warming potential line of centrifugal chillers, delivering significant energy savings and lower operating costs. This new chiller delivers up to 35 percent annual energy savings, reduced maintenance costs, and the widest operating envelope in the industry. LG is the first to offer variable-speed compressor room air conditioners in the US. These models constantly adjust speed, maintaining desired temperature and greater energy efficiency of 25 to 40 percent, depending on the model. LG is the first to earn the 2018 ENERGY STAR®Emerging Technology Award for the product. SmartView sensors detect heat, motion, temperature, light levels, CO2 levels and more to help companies understand their rates of utilization and discern the type of environment people need to do their best, most productive work. Natural light is needed to live a healthy and productive life, but the ordinary window is not optimized to provide it. View’s smart glass windows let in natural light and views, and enhance mental and physical well-being by reducing headaches, eyestrain, and drowsiness. They also reduce glare and heat, improving the energy efficiency by up to 20 percent. We have developed a substance which remains conductive beneath 1.5cm of any material, allowing us to completely conceal switches and sensors. We use the conductivity of the human body to signal the closing and opening of electric circuits. ENGAGE™ PV Polyolefin Elastomers (POEs) are high performance resins designed for photovoltaic (PV) encapsulant films. ENGAGE™ PV POEs have superior electrical resistivity and weathering stability that enable affordable renewable energy by increasing the reliability and lifetime of PV systems. The world’s 1st EV-charging solar inverter brings together two independent vertical markets to accelerate them both. Pushing charging limits, SolarEdge developed a solar boost mode, combining 2 power sources for <6x faster charging, while reducing costs. Mohamed Bin Rashid Solar Park (MBRSP) is a complex for innovation in generating power from solar renewable resources, more than 100 KM2 is dedicated to build the largest solar park in one place worldwide, with investments up to 13.5Bn USD, MBRSP is built on phases using Independent Power Producer Business Model. The world’s newest product and technology to assist with the $ 1.2 Trillion problem of food waste. The US Patented Food Freshness Card works inside and outside of a refrigerator and extends shelf life anywhere from farm to fork. Used by Supermarkets, on pallets for shipments and in the home. Chowbotics provides nutritious food anytime, anywhere with the power of robotics. Its feature product, Sally the Robot, offers fully customizable salads, snacks, breakfast bowls, and grain bowls 24/7 for commercial venues such as offices, healthcare facilities, universities, airports and hotels. We grow fresh, clean and pure leafy greens 24/7/365 using proprietary hydroponic growing technology and plant science research. The Objective Zero App instantly and anonymously connects the military community via voice, video, and text to a nationwide network of support comprised of their peers, mental health professionals, and civilians as well as wellness resources and tools to prevent suicide. Shadow’s Edge is the first mobile game designed to empower young people to discover their personal story and find the courage to express themselves authentically as they live with significant medical challenges. Octaspring® Aircraft seat cushions are the most innovative lightweight comfort solution for aircraft seats ever. Powered by Octaspring® Aerospace technology it creates the most comfortable sitting experience through dozens of individual comfort points, ergonomic zoning and 8X better breath-ability all while saving up to 30% of seat cushion weight, contributing directly to lowering CO2 emissions in-flight and on ground. New Purple® Mattress by Purple® Innovation, Inc. The New Purple® Mattress features proprietary Hyper-Elastic Polymer® technology combined with specifically-designed responsive support coils to create a mattress that sleep cooler, is more supportive and more durable than memory foam. It comes in three different price points and firmness levels. SILQ™ is a chair that transforms seating design. Through an innovation in materials science, Steelcase designers and engineers created a new high-performance polymer material that emulates the qualities of carbon fiber. This material, combined with the sensuous curves of the design, allows SILQ to respond to natural movements of the human body without the mechanisms typically required in high-performance seating. NearSky™ by CIMCON Lighting, Inc. The NearSky™ platform is a hub that connects different devices using wired and wireless interfaces. Leveraging the existing streetlight network and adding devices to it instead of building a new one, enables cities to achieve the vision of a Smart City. The platform is comprised of the NearSky™ 360 sensor hub and cloud-based NearSky™ StreetVibe™ information hub. Xperiel’s Real World Web (RWW) is the operating system for the IoT, with both a network layer and graphical programming language that operationalizes physical and digital convergence via hardware-agnostic “super apps,” bringing to life the augmented reality marketplace and new consumer experiences. SmartMat by Smart Shopping, Inc.
SmatMat is an IoT scale equipping weight-based sensor, enabling real-time inventory management and auto replenishment. With our cloud-based solution service, (1) users can be free from burdensome inventory management, and (2) suppliers can implement the proactive vendor inventory management system, resulting the decrease in the client churn rate. zSpace delivers spatial content enabling experiential learning through student-centered activities aligning to core and career and technology education curricula. Students can lift, examine, and manipulate virtual simulations from the screen to gain a deeper understanding of STEM concepts. 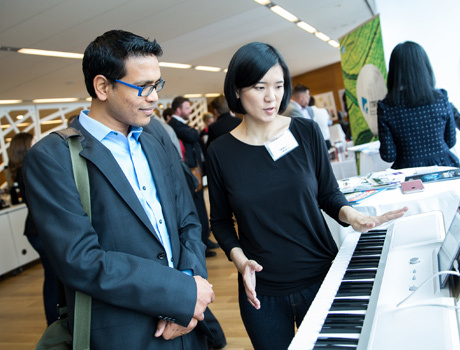 The ONE Smart Keyboard Pro is an award-winning 88-key keyboard that offers an interactive learning experience to teach users how to play the piano. The Keyboard Pro works with The ONE Smart Piano app to provide video lessons, games, and LED-guided sheet music that correspond to lights above the keys. Mango book garden is used to encourage students to share their own books in the school to their schoolmates from the self-help platform. This platform combines of Radio frequency identification (RFID) and big data analysis, to encourage students’ reading habit in the environmentally friendly way. The Fire Rover is the only fire elimination solution that fights incipient fires & explosions that combines: 1) Automated Thermal Detection; 2) Remote Human Verification, and; 3) Remotely Operated On-Site Suppressant/Elimination. Modeled on Tactical Operations Centers operated by the military and incident command posts used by first responders, the IBM X-Force C-TOC brings people together in an ultra-realistic simulated environment that forces teams to respond to a large-scale cyber security breach—right where the customer works." The Raymond Virtual Reality Simulator creates an immersive learning experience for operators by guiding them through a series of standardized lessons within a controlled virtual environment — all while using and learning on the actual Raymond truck. ICON built the first permitted, 3D-printed home in America with non-profit, New Story, using the Vulcan I mobile 3D printer. The gantry-style printer will be printing the first community of 100 homes in an underserved population in 2019 with the goal of printing each home for $4,000 at ~650 sq ft.
Velo3D helps innovators design and manufacture dream solutions. Our 3D metal printing solution predicts and corrects design deformations that occur on conventional 3D printers. We advance space exploration by producing lighter and higher performing engines; orthopedic implants tailored to the human body; and more energy efficient power plants. HP Jet Fusion 3D 300 / 500 Series by HP Inc. The HP Jet Fusion 300/500 Series is the first 3D printing solution to enable manufacturers to produce engineering-grade, functional parts in full color, black or white in a fraction of time, democratizing 3D printing for millions of innovators around the world, and helping accelerate the 4th Industrial Revolution. An EV battery pack made of inlay(core material of ProLogium solid state battery cell) with 3D structure package tech(Worldwide first BiPolar tech). This game changer design provide EV battery pack with 70% cost, 50% volume, 80% weight and the key is, an intrinsically safe promise to users. BETAFORCE™ 9050M by DowDuPont, Inc.
As OEMs face more stringent fuel efficiency legislation, a step change in mass reduction will be required beyond the capability of metals alone. Carbon fiber reinforced with epoxy composites offers the highest strength/stiffness per unit mass and must be joined effectively to the vehicle structure. BETAFORCE 9050M provide automobile manufacturers with a joining technique for composite materials enabling vehicle lightweighting. The Axalta color retrieval system, utilizing propriety Axalta data management tools and the Acquire™ Quantum EFX spectrophotometer, provides the first ever “color” and “sparkle” measurement technology to enable superior color and appearance reproduction of OEM factory paint finishes on automobiles. XUS59910.08 is a newly developed bimodal polyethylene product which enables the production of stiff/tough/clear BOPE films on a commercial tenter frame line. It promotes down-gauging and recyclability of packaging materials, which help to reduce the carbon footprint of packaging industry. Gentoo™ by UltraTech International, Inc. Traditional hydrophobic coatings are clear and abrasion resistant but do not shed fluid easily. Superhydrophobic coatings are great at shedding water but are not clear and easily removed. Gentoo is a clear coating that not only repels water but most oils and solvents as well. It is able to withstand significant abrasion without sacrificing performance. several flexible packaging are based on PET or BOPP reverse printed and laminated with PE films. Dow developed OPULUX HGT, a PU based coating able to allow structure simplification replacing PET or BOPP laminated films resulting in a single film with same functionalities. AtomLube® All Purpose Grease by NanoMech, Inc.
Retail aisles and every maintenance shops are swarming with products with no clear distinction but drawing consumers with attractive packaging. This overwhelms busy professionals and maintenance groups often leading to confusion and major shutdowns. Market research revealed great opportunity if SKUS can be reduced with a universal product. High-voltage electrical motors utilize impregnating resins to provide protection of the internal motor windings against thermal, mechanical and electrical stress. Axalta’s Voltaprem 5000 provides improvements in reduced application time and energy consumption, while reducing health risks. AtomOilTM Engine Oil Treatment by NanoMech, Inc. The life of an engine is determined by wear of its critical components. With nGlide, NanoMech's "proprietary macromolecule, AtomOil Engine Oil Treatment works to boost the performance of conventional lubricants. It is designed to selectively deposit self-replenishing nanotribological film unlike any commercial product. Ironclad and Vibram partnered together, integrating Vibram shoe sole technology into the palm of an Ironclad engineered glove. This resulted in a glove with unparalleled durability, grip, and fluid channeling characteristics, which can be used in a wide variety of industrial safety applications. The Cat® S61 is the most advanced rugged smartphone on the market packed with useful tools of the trade: enhanced FLIR® thermal imaging capability, built-in laser assisted distance measure and an indoor air quality sensor. Orion Sync™ is a push-to-talk, wearable LTE device that improves real-time workforce communication over any distance. With the power of their voice, teams can access superpowers like instant translation and automated workflows to improve productivity and connectivity in any environment. Using AI, users can receive rich information about scanned artworks through audio, video and augmented reality. App users can also save favourites into a personal collection across venues and share with friends. The idea for Smartify grew out of a human need to create meaningful connections with art. Making stories behind art more accessible and reframes the use of devices in galleries as engagement rather than distraction. ARTLENS Gallery, an immersive, multi-faceted gallery that intertwines masterworks of art and innovative technology. Designed for the digital native, the spaces have removed touchscreens and now features gesture-sensing, eye-tracking, facial recognition, and iBeacon technology. Through gameplay, visitors understand how to look at the composition, symbolism, and purpose of an artwork. Seeing is believing! 3D holograms floating in mid-air? This is something that no one expect to see. With a new interactive ability this becomes a game changing way to communicate and get your message across. Super bright, full HD resolution, portable, no glasses required! DropKey® Studio in a Bag® is the state of the art green screen tech on smartphones. Founder and CEO Rockwell Scharer solved a difficult physics problem in light to invent a pop-up, inflatable studio with bright lights and portability to make push-button perfect live HD background replacement on smart devices with no post-production required. Spire Studio is a portable, wireless, multitrack recorder that pairs with a free mobile app. Designed to reinvent recording, it makes the process much more fun and simple while still ensuring best quality sound. Musicians of all skill levels can record studio-quality music with one touch, anywhere. LessRay® is a hospital O.R. radiation reduction and workflow enhancement platform that integrates with traditional mobile C-arm systems, used to take x-ray images of the patient’s anatomy during surgery. The platform improves low-dose x-ray quality, anatomical visualization and O.R. workflow. The LithoVue Empower™ Retrieval Deployment Device takes stone removal procedures to the next level. The critical task of controlling the basket is now in the surgeon’s hand while seamlessly integrating with our LithoVue™ Ureteroscope and nitinol baskets. Caduceus by Taiwan Main Orthopaedics Biotechnology Co.,Ltd. Smart Surgical glasses featuring mixed reality technology with surgical navigation. Surgeons are able to see through the patient’s body and able to see 3D model of Vascular, nerve and trajectory or surgical instruments similar to GPS. Reduces operation time and increases efficiency by applying navigation system with less than1.5mm accuracy that shows guidance pathways on nerves and vascular that has been previously planned. QGel takes cancer tumor-biopsy cells and grows them in miniaturized environments of customized QGel formulations, designed to mimic the complex biological environment of the patient’s body. We then test many drugs to find which will work best for that patient, before treating the patient. The Guardian™ Connect system is the first smart standalone CGM system to help people with diabetes using multiple daily insulin injections (MDI) outsmart high and low glucose events. The system uses the power of real-time sensor glucose data, advanced algorithms and customizable, predictive alerts to notify people when sensor glucose levels are predicted to go too high or too low – up to 60 minutes in advance. In 2017, Abbott’s Freestyle Libre received U.S. FDA approval, becoming the first continuous glucose monitor (CGM) to remove fingersticks from diabetes management. A quick scan of a reader over a sensor worn on the back of the arm provides real-time glucose readings to inform health decisions. The Pattern System transforms the way we identify and treat human infections by reducing the lab time to identify the pathogen and perform antibiotic susceptibility testing from 2 days to just 2 hours. The Pattern system uses microfluidics and artificial intelligence to optimize patient outcomes saving millions of lives each year and changing the course of healthcare. Quality assurance professionals can use this sample ready, two-in-one indicator test for E. coli and total coliform monitoring in an actionable time-frame of 18-24 hours. The ready-to-use solution further enables processors to obtain accurate results reduce inventory hold times and protect consumers. Quantitative Polymerase Chain Reaction (qPCR) DNA-Based Legionella Test by Ecolab Inc. Traditional microbiological culture methods to detect Legionella take 14 days to complete. The Quantitative Polymerase Chain Reaction (qPCR) DNA-based method (ISO12869) detects Legionella within one day, enabling faster validation of water safety protocols and response to protect public health. FORTRESS™ is the world’s first & only additive-free liquid barrier pipette tip filter that also allows for total lab sample retrieval. It prevents liquids and aerosols from contaminating lab samples and pipettors, which allows lab technicians to more accurately diagnose patients. Inspiren’s passionate team of practicing nurses and technologists creates iN: the first cognitive patient care assistant utilizing AI, computer vision, and machine learning. iN analyzes the real-time physical and digital environment of patients to eradicate harm caused by human error. Our smartphone stethoscope is made up of three components: a phone case with a stethoscope bell, a software app, and an AI algorithm hosted in the cloud. Together these allow physicians to hear and see the sound via a real-time phonocardiogram and get diagnostic assistance from our AI tool. The AXIOS™ Stent and Electrocautery Enhanced Delivery System* provides a safe and effective transgastric or transduodenal endoscopic drainage of symptomatic pancreatic pseudocysts and walled-off necrosis under EUS imaging guidance and significant advancement over previous treatment options. Outset Medical is rethinking the dialysis market, which has seen little innovation in decades. Tablo functions like a dialysis clinic on wheels. It was designed to reduce costs and complexity while improving the patient experience – expanding the how, when, and where dialysis can be provided. I.V. House, Inc. by Metaphase Design Group, Inc.
I.V. House revolutionizes the IV therapy market with ergonomic designs that improve patient safety, increase nursing efficiency and treat patients with dignity and compassion. TLC Splints maximize dwell time, minimize traumatic restarts, support variable anatomies and eliminate tissue abrasion. Monarch™ Platform by Auris Health, Inc.
Auris Health is ushering in a new era of medical intervention with its Monarch Platform. The Monarch Platform is an innovative flexible robotics platform designed to dramatically improve patient outcomes, enhance physician capabilities, and lower costs to the healthcare system. Olympus 3D used in combination with the FlexDex wristed needle driver for suturing offers physicians a lower cost alternative to robotic surgery — with wristed instrumentation and depth perception on a laparoscopic imaging platform. These devices can be used in any OR, at any time. Project Debater pushes the frontiers of AI research to facilitate intelligent debate between machine and human. That interaction can help create well- informed arguments leading to better decisions. AIMS- Artificial Intelligence Maintaining Safety by I3 Operations, Inc. Unraveling the chaos of social media to identify potential threats using artificial intelligence to guide an analysis and provide interactions with persons of interest. Adobe has taken some of the most advanced AI and machine learning technology and placed it in the hands of everyday business users. Massive amounts of data are crunched automatically, delivering insights that help organizations run more smoothly. The We Care Solar Suitcase is a highly-efficient solar energy system powering emergency obstetric care in developing countries. The portable, easy-to-use device includes medical quality lighting, fetal monitors, cell phone and battery charging capabilities and headlamps with rechargeable batteries. The Liter of Light redesigns solar lighting for off-grid and disaster-afflicted areas around the world. Our simple solar lighting products use local parts, teach green skills, and empower local communities. Rather than depending on imported, patented, and expensive technologies, our grassroots movement embodies the principle that anyone can become a solar engineer. A growing number of Latin American eye hospitals will more effectively train eye care staff thanks to Eyexcel, a train-the-trainers course offered in Guatemala for the first time in July 2018. Eyexcel can lead to a threefold increase in eye hospitals’ reach and helps create quality jobs for women. QuadSight™ by Foresight Automotive Ltd. The QuadSight™ quad-camera stereoscopic vision system offers unparalleled obstacle detection capabilities for autonomous vehicles by fusing visible-light with thermal imaging. The system detects obstacles of any shape, form or material, under all weather and lighting conditions. The AE110 is a leading-edge artificial perception system that brings together software definability, artificial intelligence, and smart, agile sensors to deliver rapid, dynamic perception and path-planning for autonomous vehicles. Guardian Optical Technologies has developed breakthrough, patent-pending sensor technology for occupancy detection in vehicles, encompassing 2D, 3D and motion analysis in a single sensor designed to enable automobile manufacturers to produce safer, more convenient “passenger aware” vehicles at a lower cost. OEMs will be able to consolidate many sensors in to one Guardian sensor. ITRI's iRoadSafe is the world's first V2X system solution integrating roadside communications, roadside sensing, and changeable message signs to provide safety warnings to road users. With DSRC NLOS and low latency abilities, iRoadSafe provides real-time alerts to avoid potential traffic accidents. Seat Belt Sensor by Posh Wellness Laboratory, Inc.
POSH Seat Belt Cover Sensor saves many people from an unexpected car accident using ‘Smart Impedance’ technology. We have innovated a seat belt cover sensor that can monitor body posture, respiration volume and heart rate without direct skin contact with sensing electrode. Seakeeper 2 by Seakeeper, Inc. The Seakeeper 2 eliminates up to 95% of boat roll for boats 27-32 feet and runs solely on 12-volt DC power with no need for a generator or AC input. It is 22% smaller and 20% lighter than our previous smallest model and can be installed on deck level, inside a customized leaning post. Pyramid GNSS is the first full solution that allows detection, mitigation, and reporting of both spoofing and jamming attacks on the GNSS system while still providing an accurate PNT (position, navigation, and timing) solution. Pyramid GNSS is relevant to the commercial sector in terms of performance, price, size, and weight.